Product information "Reisenthel KLICKfix Bikebasket Bag Folklore black"
The bikebasket version with coupling for KLICKfix handlebaradapter is only sold in shops for bicycle accessories. The KLICKfix basket coupling is not available seperately. The KLICKfix Handlebar adapter is not included in delivery. Please choose the adapter which is the most suitable for your Bike. 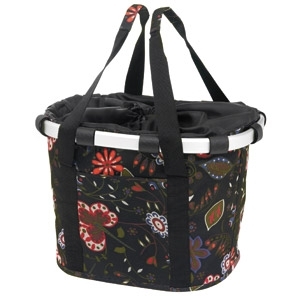 Related links to "Reisenthel KLICKfix Bikebasket Bag Folklore black"
Customer evaluation for "Reisenthel KLICKfix Bikebasket Bag Folklore black"